Pickett (Everitt) Family, cir. 1920, New Hope, Pa. 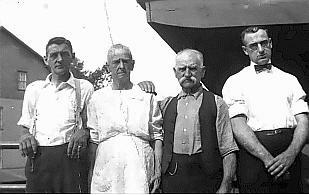 The above photo is the oldest family group picture that I have. It contains pictures of the following family members: (L to R) "Jacob D. Pickett" (17), "Louisa J. (Everitt) Pickett", "John S. Pickett" (7) and "Elmer K. Pickett" (19). This photo was taken in New Hope, Pennsylvania. The Family members names with an " * " in front of their names have additional information about them within this document. Those shown in "Marroon" are the direct ancestors of my children Chris, Ryan, Kayla & Kara. Anyone that has information or questions on this family line please "email me". Thanks, and I hope you enjoy this short history of my Everitt Family. Samuel (1) was born in Everittstown, Hunterdon County, NJ cir. 1762. His parent's names are unknown. He married "Nancy Thatcher" in 1782 in Everittstown, NJ. The date of their deaths is unknown at this time and they had one known child. 2. *Daniel Everitt - b.ca 1783, d. ?? Daniel, (2) was born the only known son of Samuel (1) and Nancy (Thatcher) Everitt in ca. 1783, in Everittstown, NJ. He married "Ann Holdron" on January 13, 1805 in Kingwood Township, NJ. Her parent's names are currently unknown. Together they had twelve (12) children. 3. Elizabeth Ann Everitt - b. Dec 8, 1805, d. ?? 4. Mary O. Everitt - b. Mar 27, 1807, d. ?? 5. Samuel Everitt - b. Mar 21, 1809, d. ?? 6. Rebecca P. Everitt - b. Feb 22, 1812, d. ?? 7. Joseph P. Everitt - b. Nov 17, 1813, d. ?? 8. Rachel Everitt - b. Dec 27, 1817, d. ?? 9. Adam Everitt - b. Jun 7, 1820, d. ?? 10. *Johnathan R. Everitt - b. May 16, 1823, d. ?? 11. Wilson Bray Everitt - b. Sep 14, 1825, d. ?? 12. John Robertson Everitt - b. May 20, 1827, d. ?? 13. Daniel Everitt - b. Jun 24, 1829, d. ?? 14. Francis Mun Everitt - b. Oct 30, 1831, d. ?? 16. Rachel Ann Everitt - b. 1850, d. ?? 17. George Everitt - b.1852, d. ?? 18. Ellen Everitt - b.1854, d. ??
" John S. & Louisa J. (Everitt) Pickett (15) "
Louisa (15) was born the 1st child & 1st dau of Jonathan R. (10) and Mary Ann (Naylor) Everitt on January 13, 1846 in Lambertville, NJ. She married "John S. Pickett" (#7 - "Pickett Family History") on October 3, 1866 in Lambertville, NJ. He was born the son of Edward and Catherine (Conover) Pickett on August 8, 1844, apparently in New Hope, Pa.
Louisa purchased the north half of the double house fronting on River Street from her father-in-law "Edward's (1) Estate" sometime after her husbands death. John died on December 27, 1925 at the age of 81 & was interred in Riverview Cem., Lambertville, NJ on December 31, 1925. Louisa (15) died on August 18, 1927 also at the age of 81 & was interred next to her husband on August 20, 1927. 20. Elizabeth A. Pickett - b.ca 1868, (Age 2 in 1870 census), d. ?? "John S. Pickett" - "Louisa Jane (Everitt) Pickett"
" Pickett Family History ". Jacob Dunlap Pickett (21) & Eleanor Minerva (Smith) Pickett had a son: "John Ernest Pickett"
John Ernest Pickett & Winnie Ann (Bacon) Pickett had a son: "John Ernest Pickett, Jr."
Russell Stout Pickett & Diane Sue Collison had two sons: "Christopher Scott Pickett" & "Ryan Mark Pickett"
Russell Stout Pickett & Ruth Elizabeth Hardy had twin girls: "Kayla Grace Pickett" & "Kara Virginia Pickett"